Thanks to Andrew Graham-Stewart for permission to reprint this chapter from his book "The Salmon Rivers of the North Highlands and the Outer Hebrides". Thankfully catches have improved dramatically since Andrew wrote his book. The recent history of the Alness is testimony to one of the most remarkable transformations of a Highland salmon river in modern times. Until just a few decades ago this east coast spate river was of marginal interest from an angling point of view. In terms of salmon rivers the Cromarty Firth was, throughout the 19th and for most of the 20th centuries, viewed almost exclusively as the long estuary for the Conon, universally accepted as one the north’s great systems. 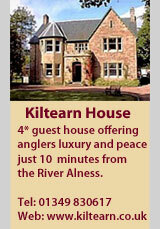 By comparison the Alness, with its mouth half way down the 20 mile long Firth, was barely accorded a mention. 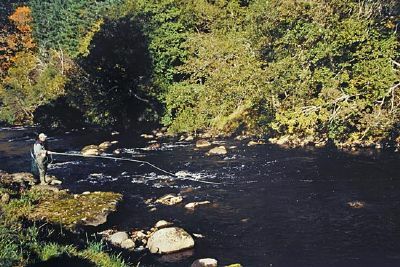 The river’s status was hardly surprising given the level of rod catches; a hundred years ago they amounted to a maximum of 30 salmon/grilse per annum and up to 150 sea-trout. The real value attached to the river was the lucrative netting rights at the mouth- taking both Alness fish and passing Conon fish. The source of the Alness is in the mountains of Kildermorie Forest in Easter Ross, close to the watershed of the upper Carron. The river, known in this upper section as the Abhainn na Glasa, flows for some ten miles, first through flat high moorland (excellent spawning territory) and then through a fast tumbling boulder-strewn section, to Loch Morie. The latter, surrounded by precipitous hills, is very deep and some two miles long. Incidentally both Grimble and Calderwood stated that salmon could not “reach Loch Morie”; this is clearly erroneous as below the loch there is no obstacle of any consequence. 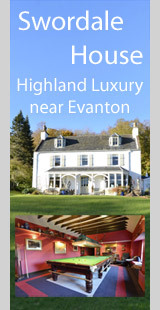 From the loch the Alness (also known as the Averon) has a course of 12 miles- initially at a sedate pace through moorland and then much more swiftly through gorges and heavily wooded sections- to its mouth below the town of Alness. It has one of the steepest descents (over 600 ft) of any river of comparable length in Scotland, although there is no significant waterfall, and is one of the most stunningly attractive rivers in the north. Two miles below the loch the river receives its most important tributary, the Blackwater, which runs down Strath Rusdale from the northwest. In the early 1800s Sir Hector Munro, a general who had made a fortune in the East India Company, put together a major estate in Easter Ross, which in due course became known as Novar; the holdings included most of the Alness. One section excluded was that attached to Ardross Castle, half way up the river; here some importance was attached to angling as a network of catwalks to facilitate casting was constructed in the mid 19th century. The Salmon Fisheries Commission of 1863 concluded that the Alness (“owned by Munro of Teaninich, Matheson of Ardross and Munro of Novar”) was “very badly managed” but that it “might be made a very valuable stream, were it not overlapped by two stake nets”. Management did not improve and in fact it became more difficult as during the first half of the 20th century Novar divested some of its interests in the river; in essence ownership of the salmon rights became highly fragmented. Right up until the 1960s very little priority was given to salmon angling. In fact back then the lease of the shooting rights at Novar included seven single bank miles of the river at no extra cost; in truth the fishing could hardly be marketed separately as the annual rod catch of salmon/grilse for the whole river often struggled to reach double figures. Then some 40 years ago the late Arthur Munro-Ferguson, descendant of Sir Hector Munro and laird of Novar, determined to realise the potential of the Alness and turn it into a viable rod fishery. The task was immense, but he had a great affinity with the river and, crucially, a vision of what was possible. He set to work on a variety of fronts. Wherever possible he extended and rationalised Novar’s ownership, so that in due course the estate had some 70% of the river (double bank) between Morie and the sea. He hired a huge bulldozer and excavating machine, with which he created a network of tracks, allowing easy vehicular access to all the estate water- a massive undertaking; prior to this much of the river had been essentially cut off by dense woodland. The same machine was employed in the river. Whilst initial advice on pool improvement was obtained from fishery consultant the late Neil Graesser, the hands-on day to day management of a most ambitious programme involving 50 or so pools and extensive other works was under the control of the then river superintendent Bill Topham, whose attention to detail proved in the ensuing years to be invaluable. Boulders were moved, creating long large pools wherever there was a flat section of water; in addition in the faster sections innumerable small runs and pots were enhanced and developed. The amount of holding water was increased immeasurably; the fish, that had previously tended to navigate the river through to the loch with hardly a pause, now began to move upstream more slowly. Inevitably some croys have been washed out- particularly in a tremendous flood in 1989- but most are still in place and have blended into the natural surroundings. A hatchery was built in 1980; since then between 150,000 and 200,000 fry have been planted out annually in inaccessible areas; it is perhaps worth noting that ova from the Helmsdale were introduced to the system in the 1920s. In 1979 a small dam incorporating a fish pass was constructed at the outlet from Loch Morie; judicious use of the stored water allows a spate to be prolonged by a week or two. Mr Munro-Ferguson split the Novar water into six rotating beats (emulating to some extent the Helmsdale) and a Home beat; the latter was subsequently scrapped in a further reorganisation. Netting at the mouth finally ceased in 1987; in 1992 the rights were acquired by the district fishery board. All of these factors combined to create a viable rod fishery and the results have been impressive. In the 1980s the Novar beats averaged close to 250 salmon/grilse per season. Given that it is a spate river substantial variations are inevitable; in the wet season of 1985 Novar had some 600 (the total for the whole river was some 750). Since the mid 1990s the average for Novar, to some extent reflecting the global downturn in salmon stocks, has dropped to 150; it is also fair to say that angling pressure is less now than it was in the 1980s. The Alness’s main grilse and summer salmon runs are from mid June. It is a late river with a genuine back-end run; indeed sea-liced fish were caught this October. There is still a race of heavy late-running powerful salmon, in the 12 lb to 16 lb class with much bigger fish among them, the majority of which come in during late October and November- after the end of the rod season; they are usually known as greybacks or bluebacks. Locals in Alness, who regularly watched them surmounting the sluices at Dalmore, refer to them, for some unknown reason, as “Norwegians”. There is also the remnant of a spring run, with the odd fish taken in May. There was (and perhaps still is) an earlier run; certainly bailliffs’ reports from the early 1900s refer to springers running in April. It appears that rudimentary attempts to develop the spring runs, presumably for the benefit of the nets, were made in the 1920s by purchasing limited quantities of ova from the Helmsdale. It is thought that early running fish were adversely affected by the absence over many decades of an effective fish-pass at the weir at Dalmore; the latter was a temperature barrier, below which springers were highly vulnerable. The situation was rectified 20 years ago with the construction of a new fish-pass. The Alness is very much a “hunter’s river”. Whilst the larger pools may be fished conventionally, much of the water is difficult to read and needs a different approach. Small lies are everywhere- the Alness is one of the great dibbling rivers. The finest exponent of this art was Arthur Chamberlain; he fished the river for 40 years, finally hanging up his rod when he was 90. His knowledge of the lies was supreme and, such was his skill, he had an uncanny ability to take a fish from the river at will. His confidence was such that with many lies, if he could not induce an instant take, he would simply declare that “he’s not there”. Some sections of the Alness can really only be tackled with a dibbled fly. Both methods of dibbling are effective- the dibbled dropper and the dibbled tail fly; the latter is usually a version of a Collie Dog skated between the boulders. 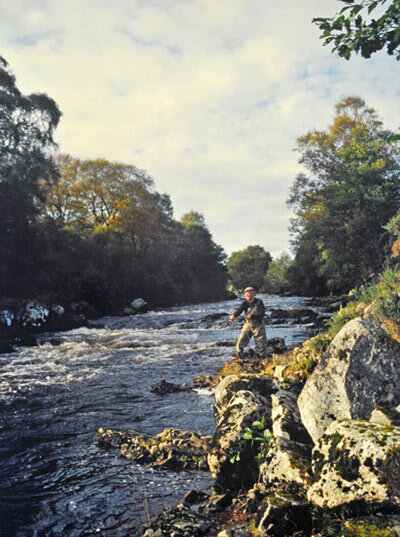 Apart from the Novar water, there is also a thriving club, the Alness Angling Club, with two miles of the lower river (from the Douglas pool to the sea) as well as a mile below the junction with the Blackwater; between 2000 and 2002 the club averaged 94 salmon/grilse and 60 sea-trout.